We decided the kids needed a specific space to study, to work. Not such a place to play or be noisy. More of a personal space, where friends don't play. This was Otis's bedroom before he moved into Caspar's room, it's beautiful and sunny. Caspar calls it the 'study room'. Most of all I wanted the space to be enticing. Otis has most of his materials in here. Caspar doesn't so much have materials rather resources for his research. This room has a built-in wardrobe where Caspar stores most of his written materials and resource library. Otis also has a shelf in the wardrobe, it currently has his lock box and more model animals. I also wanted the space to reflect Caspar and Otis's interests. In Caspar's case this is science and geography. Otis is currently in a puzzle phase and this is reflected in this space too. I think it's a good mix. Our block area and play trucks are all in our living area, which works well as it gives the children a fun place to play together and use when friends come over. We also have a lot more plants in this space compared to before. We're finding plants more sustainable (especially in the colder months) than cut flowers and it gives the children more opportunity to explore and care for plant life. Today I was planning to give you a tour of our study. Unfortunately Caspar was home from school, he injured his foot at soccer on the weekend. He's having x-rays tomorrow. So while taking photographs of the study I became a little distracted. .
Otis is using some eco clay and some new tools that he received for his birthday. His favourite thing to do with clay is to add buttons. Caspar made some cute clay-button creatures. Tomorrow will probably be spent at the doctors but I will try to snap some pictures of the study too! As with most parents, I spend a lot of time in the kitchen. I would not call myself a good cook but I'm finally getting the courage to experiment. I've made banana bread everyday this week and everyday I've included something different, something extra to keep it interesting. I also try to keep my baking nut free, just in case there is any left over for Caspar's lunchbox. This is the basic recipe I used today. Dry mix: 1 cup white spelt flour, 1 cup wholemeal spelt flour, half a cup rapadura sugar, 1 teaspoon natural/pure baking soda, approx 1 teaspoon of cinnamon, approx handful of crushed pepitas and approx handful of pitted dates cut into small pieces. Wet mix: 2 large bananas mashed, 2 eggs and 60 grams butter melted (and cooled). Method: Use a whisk to thoughly combine dry ingredients. Mix wet ingredients. Combine wet and dry mixtures and pour into a lined bread tin. Bake for approx 30 minutes at 180 degrees or until cooked and nice and brown on top. Another variation that I really like is to add desiccated coconut to banana bread. Today I also made the Banana, Oat and Dried Fruit Lunchbox Slice from Wholefood for Children. This slice freezes nicely so it's a perfect back up for the lunchbox when I haven't had time to bake. P.S I have a new lens for my camera, I think you can see the difference. These shots and the ladybug layering puzzle photos are all taken with the new lens, it lets a little more light in and is definitely sharper. Thank you to my father-in-law for the photography advice. It's puzzle mania around here. Otis is definitely in a sensitive period for puzzles - if such a thing exists. These puzzles are a combination of support and challenge. The above vehicle puzzle is easy for him but it's fun, so he repeats it. He's also practising his language as he names each vehicle. We have a couple of sequencing puzzles out. The one above has three shapes each in four different sizes. He doesn't always finish this - so it's challenging him. He is also using this one which is quite complex, you can see him using it here. This apple sequencing puzzle is also challenging not because of the size graduations but because of the shape, the leaf and stem on the apple require more precision than shapes. For Small Hands currently has a small range of sequencing puzzles by Tuzzle on sale. Otis loves farm animals and therefore this farm animal puzzle. This is also challenging as two pieces, both the mother and the baby fit together into the space. I really like the images on this one and again this is also really good for language development. The two piece geometric shapes puzzles mentioned here are also favourites. In the last couple of days I've introduced Otis to his first layered puzzle. I wouldn't say this is a favourite yet but it is a really beautiful hand made puzzle. There are a lot of Montessori DVDs on the market. It's difficult to know how valuable they are to parents. There are many DVDs that I would like to see but they are expensive and difficult to obtain in Australia. A couple of months ago I chose seven DVDs that were of particular interest to me (Otis is 2 years and Caspar is 5 years old) and only now have I found the opportunity to watch them all. Most of these DVDs are very good. Most of them are more valuable then reading a book. Being able to observe children in Montessori environment, how they interact is something you cannot see in a photograph. A couple of these DVDs are fantastic, read on for my reviews. Montessori Under Three is presented by two highly regarded Montessorians; Dr Montanaro, the author of one of my favourite books Understanding the Human Being and Judi Orion. The DVD is based on the concept of a traditional family, any family that falls outside this traditional family concept will struggle with the first section of the DVD. It starts with discussion on the infant's attachment to the mother "a good attachment means a good detachment". However most of the DVD is dedicated to the benefits of attending a Montessori Mother-Infant Centre and later a Infant Centre (which appears more like a toddler community). This is great if you have a centre near you but not so good if you don't. I like that you are able to see the Mother-Infant Centre in some detail, you can see the children interacting with the environment. Most of all I liked listening to the parents discussing Montessori and the hands on help they have received. I would recommend this to parents considering attending a Montessori Parent-Infant Community. I purchased this DVD because it is presented by Jan Kitzen-Lunchenta the author of Awakening Your Toddler's Love of Learning, which is a fantastic Montessori book. 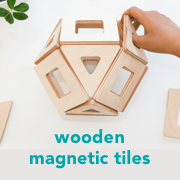 It is set in a Montessori preschool although many of the materials used are not traditional Montessori (this is not a negative or a positive but worth mentioning). It commences with discussion on nutrition which is one of Jan's areas of expertise. We are shown a child who behaves poorly and is rehabilitated through better nutrition. We are given a tour of the classroom and see how the children interact with the many materials and with each other. There are many activity ideas including early literacy ideas and demonstrations on things like the three period lesson and sand paper letters. We are show how to encourage independence particularly in the area of self care and dressing. Most of all I like the discussion on conflict resolution. There are many demonstrations on conflict resolution from children being aggressive to not sharing. You can see and hear how Jan handles the situation and I know a lot of parents would benefit from this. I would recommend this to parents with toddlers and especially parents setting up or running their own Montessori toddler group. As I mentioned here Edison's Day is highly regarded. It is shown during Montessori training and at Parent Education events. It shows 20 month old Edison though an entire day. Both of Edison's parents are Montessori trained and have an ideal home environment. This is a really practical DVD. It is wonderful to be able to see and hear Edison and his parents in their home. Lots of at home inspiration and ideas. I recommend this to parents with an infant or toddler under 2 years. I highly recommend this to any school or group with a parent education library. This DVD should be more widely available to parents. Following your Child: A Montessori Philosophy of Parenting. 2000. 25 minutes. $29 (including free shipping within the US). This provides a really good basic understanding of Montessori parenting. The focus is on the home environment for the first three years. There are many home set-up ideas that are really simple and completely doable. This is not at all overwhelming. There are lots of concrete ways of following and respecting the child. There is discussion on the key areas of; Movement, Order, Language, Respect, Independence and Responsibility. I love the discussion on following your child's cues to understand what their needs and abilities are and how to provide a home environment that satisfies these. I love the discussion on focusing on activities that interest the child and to prepare them so that the child can be successful. The best part of this is hearing from the parents and sharing in their experiences. I highly recommend this to parents with young children, especially those new to Montessori. Full of Montessori in the home ideas which will be of particular interest to those new to Montessori. It contains home environments for young children and parents who discuss their Montessori experiences. Children are shown at home cooking, cleaning, dressing, gardening etc. There is a good balance between theory and the practical application of Montessori. Home environments with floor beds are shown and other simple adaptions like light switches, step stools etc. This is an instructional DVD aimed at teachers in Montessori biology. I ordered it because Caspar (five years) is interested in science and I would like to extend his nature study at home. This takes you step by step, in an instructional way through biology in the classroom but has so many ideas applicable at home from gardening to plant and pet selection. It has given me lots of ideas for home, there are lots of nature study books and guides but I love that this is very specifically Montessori. It means that I have a better understanding of biology in the classroom which can help me extend the activities at home. I recommend this to Montessori teachers or homeschooling parents who want or need further information on Montessori biology or nature study. This very specifically discusses the qualities for a five going on six year old as the child moves from being a sensory explorer to an abstract thinker. It was very useful for me as Caspar is in this age group. You hear from teachers of students in this age group who discuss the classroom and how it meets the child's needs. The teachers explain their work and the thinking of the child. It is based in the classroom including a wonderful farm area. It also shows many of the activities and materials a child of this age may be using and how the teachers follow the interests of the child. You also get to hear parents describe what Montessori brings to their children. There is also discussion on the importance of the child finishing the three year cycle and the benefits of the thre year age grouping in the class environment. I recommend this to parents with children four or five years old. I highly recommend this to any school or group with a parent education library. Following your Child: A Montessori Philosophy of Parenting and The Making of Great Little People are both standouts for me and I will be recommending them over books, especially to anyone new to Montessori. Have you seen any of these DVDs? What did you think? I would like to introduce you to Kit. She is six months old and lives with her Mum Belle and Dad Tim in Sydney. Quite remarkably Kit and her family live in a small flat with zero storage which explains why her Dad's bike is mounted in her room. Belle was first exposed to Montessori through her Stepmother's involvement at her brother's Montessori school. Although Kit's room can only be described as tiny it's not lacking in any way. I know you'll love and appreciate the details as much as I do! Above you can see Tim's bike securely mounted to the wall (a necessity for the tight spaced flat) next to her change table and Gobbi (from Etsy). The elephant decal above the wall mirror is from The Wall Sticker Company. Kit has several mobiles which is really needed at this age. Mobiles are generally rotated to keep the child's interest. You can see that Kit has visual and tactile mobiles. 3M hooks are used on the wall to keep the mobiles that are not being used out of the way and prevent Kit from being overstimulated. Above left Kit is playing with her wooden rattle and to the right is with her Primary Colours Mobile (from Beginning Montessori). You can see how much Kit loves her mobiles! Above Kit is playing with the giant pom pom that Belle made from wool. The pom pom has bells threaded at the top and hangs on elastic. Kit started batting at it and now grabs it with her hands and feet and shakes it. You can also see above how Kit is interacting with her wall mirror. Above left Kit is reaching for her crawling basket which can be seen in further detail below. Above right Kit is under a bird mobile from Puka Puka. The mobile stand can be moved from room to room and was made by Belle. So clever! It is made from a heavy hard wood which has been sanded smooth and oiled. The mobiles are held by a piece of aluminium attached to the wood block. The mobile stand is 1.5 meters high and is so easy to transport that it sometimes goes with Kit when visiting her Grandparents. Above you can see the floor of the room is covered by rubber tiles from Clarks rubber. The flat is rented and Belle wasn't entirely comfortable with Kit crawling over the existing carpet. What an easy solution. On the right are big bookshelves. The first two bookshelves are used for storage and the front is covered by MDF which is held securely in place with industrial velcro. A blackboard wall sticker has been applied to the MDF for aesthetics and also for Kit to use when she is older. The end bookshelf is left open for Kit's baskets. The fish mobile show above was handmade using bath toy fish and fishing line. The breastfeeding chair is from Ikea. The floor bed mattress is also from Ikea. There are two pieces of artwork attached to the wall at a perfect height for Kit. The baskets above and below are from Ikea. I love these as they provide for a wonderful tactile experience. Kit loves the coarse texture and they crumple down if she rolls on them. The basket above left is her teething basket. This basket contains wooden beads, a face washer, Sophie the Giraffe and a gifted little wooden football. On the right is her crawling basket. 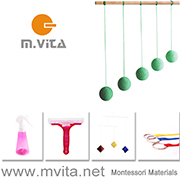 It contains the Manhattan beads from Hello Baby Direct and the Ball Cylinder from Beginning Montessori. Both of these baskets are kept at the end of Kit's bed. Above top left is a collection of books and a musical instrument basket. The books are rotated every fortnight. The Owl and the Pussycat is Kit's current favourite. In the basket there is a rattle from Infancy, another wooden rattle from Eco Toys and interlocking rings from Beginning Montessori. Above top right is a basket including an egg and a cup and a stacking toy from Eco Toys. These are a little advanced for Kit so they are stored on the higher shelf. This is a great example of thinking ahead by Belle. These toys are the next stage for Kit and I'm sure will be used within a few months. It's great to be prepared and have some toys ready. On the bottom left there is a basket for soft toys. On the bottom right a basket of pom poms and a basket of soft finger puppets. The finger puppets are from Ikea. Here you can see the baskets in the bookshelf and some low art work. Overall Belle stresses that you don't need to spend a lot or have a lot of space to create a wonderful environment for your infant. I absolutely adore this room. What do you think? I'm joining with Corporate Accountability International this Mother's Day to say that I'm a mum and I'm not loving it. Further details at Moms Are Not Lovin' It! We've had family visiting and it's been pretty noisy and a little crazy around here. Parachute play with a few balloons just added to all the excitement. Unfortunately my kids don't stay still for photographs so it's really just one big colourful blur.